Am I seeing huge bargeboard? Like they form a wall between tires and sidepods. It is all black so not sure if I am seeing straight. The bargeboards are quite small acctualy, but the blackness in that area makes it difficoult to see. I think that it is safe to say, that our sidepods are unique in the paddock, not a Ferrari copy as some say. Wow that's an undercut right there.. This looks suspiciously like aluminium gearbox to me. Edit: the best comparison pic i could find of FW40, but it is not hi res. Edited 1 time(s). Last edit at 02/03/2018 10:20 by tomazy. Also, during the test Lowe confirmed the gearbox was still an aluminium casing. It was speculated in the car’s launch analysis, that the casing might have moved to a carbon outer case, but this isn’t the plan this year. Instead the aluminium case will remain for at least 2018, Lowe adding “a carbon case isn’t necessary to be competitive in F1”, while the pressures of weight saving to get down to the minimum weight limit, may be aided by the structural efficiency of carbon. An aluminium case is certainly possible to be either as light or strong as a carbon case, but not both. Its noteworthy that aluminium loses strength at higher temperatures, remembering also that the gearcase houses not only the hot gear cluster, but also the exhaust turbine for the turbocharger. 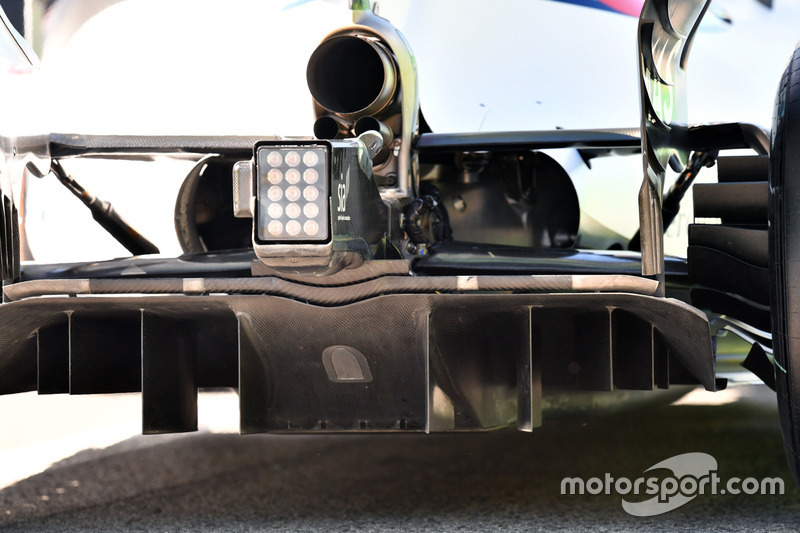 Williams have had a number of inboard suspension failures over recent years, other F1 designers have speculated that they and other handling issues suffered by Williams, are attributable to the aluminium case. As Williams remain the only team to run a metal casing, with Renault being the only other team up until this year, albeit they ran a stronger titanium case. It has made its sidepods shorter than everybody else, and even shorter than last year's Ferrari. The sidepods on the FW41 start where the head protection of the driver starts. Mercedes' solutions are in evidence here too, Williams following the general trend towards the defending champion's long wheelbase. The new Williams, which is a big step on from last year's car, has also adopted Mercedes' concept for its front wing and endplate - with the two outside opening gills in evidence. Beneath the nose, Williams has designed its version of the Mercedes cape, which starts a bit further back compared to the original design. The bargeboard area of the Williams is also reminiscent of the Mercedes W-floor design, with several 'fingers' helping direct airflow. Back in 2016, now Williams technical chief Paddy Lowe who was then at Mercedes said he was surprised that few people had copied that idea such were the benefits to be had. With the Williams FW41 the team intends to reverse the gradual slide in competitiveness since its strong performance in the first year of the V6 hybrid turbo engine regulations. Having returned to the team last year, Paddy Lowe’s technical eye has been cast over all departments in a bid to rejuvenate the team supported by former Ferrari man Dirk de Beer, who is now head of aerodynamics. The product is the Williams FW41: a car which is clearly a departure from its predecessors, yet one with a discernibly methodical approach to its wholly new design. The FW41 “isn’t just a genesis of a new car, it’s a genesis of a new team,” in the words of chief designer Ed Wood. “Some big changes happened over the winter and during the early part of 2017,” he added, of which Lowe and De Beer were just the two most well-known. Lowe brings a wealth of knowledge from Mercedes but what we have here is not exactly a W08 with Martini stickers. Arguably Lowe’s key strength is on the mechanical side and while much of whatlies below the skin of the FW41 remain a secret there are already a few areas of the car reminiscent of his previous work. The midriff of the car, which was concealed at launch by carbon fibre, black paint and darkened images, exposes a significant chunk of the team’s winter work. The all-new bargeboards are greatly evolved over last year’s. The footplate area is heavily fluted, consisting of an array of ‘teeth’ that extend forward from the leading edge of the floor and intersect the base of the bargeboard. The fluting creates lots of small pressure gradients, leading to the generation of a series of vortices that wind up into one as it is pushed outwards by the bargeboards that help seal the floor, boosting downforce. The sidepods have an air of Ferrari about them, however, and their design is a genuine masterpiece: by using the low-slung side impact protection spar an extreme undercut has been created below the wide, but narrow, inlet, providing a huge volume for airflow to travel through. The undercut is protected by a plethora of large baffles surrounding the inlet, defending it from the turbulent wake of the tyre ahead. The front suspension has received a bit of an inspection over the off season. The high wishbone layout favoured by others hasn’t been adopted, nor the extruded clevises, but the carbon fairings have been heavily sculpted to manage the air around the front tyre. How big a step forward they have made, and how quickly they can realise it given the compromised start to testing due to last week’s poor weather, is now the crucial question. "both in terms of being prepared to adopt features on the car which may lead to a loss of performance but that we feel, in the long term, is the right direction to go"
That sounds negative to me but surely they are so sure about the concept which pushes them into this.